If you are traveling alone or with a partner joining an existing safari group can be a great way to save money and make new friends and share the Fun!. Meet great people with similar traveling interest as we take you to hand-picked locations filled with wildlife, scenery and adventure. We have scheduled safari departures every two times a week, so it’s easy to join. You get unparalleled access to the famous Tanzania National Parks: Arusha National Park, Kilimanjaro National Park, Tarangire National Park, Lake Manyara National Park, Ngorongoro Crater, and the great Serengeti National Park. Our group joins safaris mostly is Budget Camping Safari, you will be grouped with fellow travelers. The maximum number of people traveling in a 4×4 safari jeep with an open roof is between 4-5-6 people accompanied by the driver guide and the chef and everybody will have a window seat and that is GUARANTEED! This makes your safari adventure very affordable and you will spend a great time socializing with like-minded travelers. Enjoy the encounters of the game drive in a 4x 4 Toyota Land Cruiser or Land Rover with open roof safari vehicle, and budget camping in the Dome tent with combination of accommodation on 2 Star Hotel to feel for the untamed spirit of your roots as you will be bush camping and exploring the wilderness under the African stars in a Dome tent camping and commune with traditional African, Tanzania cultural. The evening is spent around the camp fire listening to the sound of the dark African night – the distant roar of Lion and the doleful, whooping, “laugh” of the Hyena. All the safari camping tents are prepared for you by our safari Chef & Crew and meals are prepared by our professional camp cook. Camping safari in Tanzania: These safaris are an inexpensive option to see the highlights of Tanzania but still with comfort.We provide good quality equipment, three meals a day with an enjoyable evening supper around the campfire – we place a strong emphasis on excellent bush cuisine. For people who want to do luxury camping,our camps are set up by an experienced back-up team in advance. They consist of walk-in tents with beds, duvets and pillows; the main camp features a campfire, dining table and chairs, with full crockery and cutlery, refrigerators, cold drinks, and freshly prepared meals. We also set up hot showers and eco-friendly toilets. Amazingly, not a trace of our presence is left behind. Budget camping is the ideal way for those who like to “rough it”. Accommodation is provided in a public campsite with a two-man tent with folding safari beds, mattresses, pillows blankets and bed sheets. The tents are spacious enough for two people and have a mesh on each window to keep off insects. 25/04/2019: Tarangire National Park – Overnight Fanaka Campsite. 26/04/2019: Lake Manyara National Park – Overnight Fanaka Campsite. 27-28/04/2019: Serengeti National Park – Overnight Seronera Campsite. 29/04/2019: Serengeti National Park – Overnight Simba Campsite. 30/04/2019: Ngorongoro Crater Tour – Return back to Arusha town. 27/04/2019: Serengeti National Park – Overnight Seronera Campsite. 28/04/2019: Serengeti National Park – Overnight Seronera Campsite. 07/08/2019: Lake Manyara National Park – Overnight Fanaka Campsite. 08/08/2019: Serengeti National Park – Overnight Seronera Campsite. 09/08/2019: Serengeti National Park – Overnight Simba Campsite. 10/08/2019: Ngorongoro Crater Tour – Overnight Fanaka Campsite. 11/08/2019: Tarangire National Park – Return back to Arusha town. 20/10/2019: Tarangire National Park – Overnight Fanaka Campsite. 21/10/2019: Lake Manyara National Park – Overnight Fanaka Campsite. 22-23/10/2019: Serengeti National Park – Overnight Seronera Campsite. 24/10/2019: Serengeti National Park – Overnight Simba Campsite. 25/10/2019: Ngorongoro Crater Tour – Return back to Arusha town. 22/10/2019: Serengeti National Park – Overnight Seronera Campsite. 23/10/2019: Serengeti National Park – Overnight Seronera Campsite. 24/07/2019: Tarangire National Park – Overnight Fanaka Campsite. 25/07/2019: Serengeti National Park – Overnight Seronera Campsite. 26/07/2019: Serengeti National Park – Overnight Seronera Campsite. 27/07/2019: Serengeti National Park – Overnight Simba Campsite. 28/07/2019: Ngorongoro Crater Tour – Return back to Arusha town. Enjoy the encounters of the game drive in a 4 x 4 open roof safari vehicle, and camping in the dome tent, feel the untamed spirit of your roots as you will be staying in bush camping and exploring the wilderness under the African stars and commune with traditional African, Tanzania cultural. The evening is spent around the campfire listening to the sound of the dark African night – the distant roar of Lion and the doleful, whooping, “laugh” of the Hyena. All the safari camping tents are prepared for you by our safari crew and meals are prepared over a campfire by our professional camp cook. A tasty meal prepared by our camping chef from a planned safari menu. The menu is usually wholesome, simple food. The choice of being fully involved in daily camp life. Staff and supplies travelling with the guests in a same vehicle. Camping safari participation involves guest more intensive in the challenging but rewarding life of a nomad, providing a very unique experience. 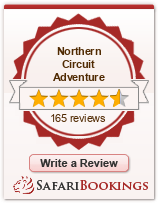 ‘We guarantee that you’re getting the best price when you book direct with Northern Circuit Adventure and they will be no cancellation and no amendment! Each group has 2 people already booked and they are 3-4 more seats left in each group traveling in a 4×4 safari jeep and everybody will have a window seat! For more information about the tour plans with the details go through to our itineraries page or send us an email or call and we will get back to you AS SOON AS POSSIBLE! At Northern Circuit Adventure we want to make it easy to book your safari, whether you book with us online or over the phone we are committed to ensuring you receive the best possible service from us!